Our children spend almost as many waking hours at school as they do at home. And our teachers spend even more time at school than our students! So when a few parents learned about the drab teachers’ lounge at the Benajamin D. Foulois Creative and Performing Arts Academy, we knew we had to do something. We wanted the staff at the school to know that we loved them for loving our kids. We wanted the staff to know that those moments they spend making sure our kids eat their lunch, catch their bus, have their homework in their backpacks, and know they have a safe place are VERY noticed. Walking into the teachers’ lounge wasn’t nearly as shocking as walking into the lounge for the food service workers. Both rooms were dirty, dark, and unloved. Something had to be done. So over the course of about two months, the four of us worked with our principal to develop a plan: We would paint, clean, decorate and give some life to both spaces. Our plan included using the school’s colors, blue and yellow, to give the space some spirit. We wanted to give the space a touch of practicality too, by doubling the amount of refrigerator space and providing more places for lunches to be cooked. After we developed our plan, we scoured CraigsList, FreeCycle, Facebook Market Place, thrift shops, and worked with the management at our local Home Depot to stay within a very small budget — and a lot of heart — to fill the lounges with a new work station, new table, new decor, a new microwave and refrigerator. 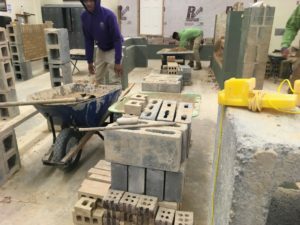 Over the week of PGCPS’s spring break, we went to work. We spent the first day cleaning. Everything from the chairs to the floors to the butcher paper, everything got a solid scrubbing. We spent days two and three painting the walls and cabinets, painting a chalk board sign for motivational quotes, and putting up vinyl decals to match our theme. The fourth day consisted of putting it all back together. Our Falcon blue and yellow teachers’ lounge now has a fun and spunky feeling with a quote that reads “Be the teacher who eats the last cupcake in the teachers’ lounge because we need teachers who are FEARLESS!” And the food service workers now have a room that makes it feel like spring has sprung! Board Member K. Alexander Wallace (District 7) answered our questions about the new Customer Service Handbook developed by Prince George’s County Public Schools (PGCPS). He also gave us insights into the new “secret shopper” initiative. The views expressed are Mr. Wallace’s own and do not represent those of the school system. How was the idea for the Customer Service Handbook developed? Tell us a little bit about the philosophy behind the new handbook. ​While the Customer Service Handbook was something developed by the Maxwell administration and through the work of our PGCPS ombudsman, Dr. Edward Newsome, the topic of and discussion around bettering the interactions of all internal and external PGCPS stakeholders ​grew over time through collaborative discussions between the board of education and senior level administration. As board members, we are often told stories of inappropriate actions, statements, or interactions of staff members, whether it be to a colleague or to a student, volunteer, or family member. Even a few board members themselves have received unsatisfactory customer service from PGCPS employees. While these actions, statements, and interactions do not speak to the dedication of the vast majority of our nearly 20,000 employees, there is truth to the notion that “one bad apple spoils it for the whole bunch” — pun intended. What is the timeline for training employees on the new handbook? Is there an initial area of focus (e.g. school offices, secretaries, transportation, etc)? ​The timeline for employee training and the order in which departments are trained will be decided by the administration. ​It is my hope that the training start with our support staff. While every department within the school system is extremely vital, it is a known fact that for every teacher or principal a student interacts with, there are several more support staff members (paraprofessionals, nurses, bud drivers, security assistants, registrars, cafeteria staff, building and maintenance staff, etc.) that students interact with — sometimes before they even step foot into the classroom. Did looking at other school systems inform the development of the Customer Service Handbook? Who was involved in the creation of the handbook? ​From the briefings​ that I have been a part of, which were open to the public, the point was made very clear that not too many school systems of comparable size and demographic to PGCPS had a formal document that all stakeholders could point to and hold individuals accountable. Due to this, the handbook was formed out of a few key examples, including well known companies and organizations known for their high level of customer service: Nordstrom, Chic-fil-A, Ritz Carlton, etc. Today was a good day. I witnessed an event at Bowie High School that reminded me of all the good that happens when we work together. I was reminded that although we don’t literally live in villages, we still need the support of the village community, especially for our young people. My village is comprised of both rich and poor. Parents who can afford the best for their children and don’t need help, and parents who desperately need help so their children can grow up healthy with the opportunity to reach their full potential. A community of people who send their kids to private school, and a growing contingent of committed parents who are investing in their local public school. That is where I fall. I believe in public schools and the children who attend them. I am committed to helping change schools for the better. As parents, we all want the best for our children, but so often we don’t know what is needed or how to get it done. So we came together. It was during a conversation after a Parent Teacher Student Organization (PTSO) meeting this past February when the idea blossomed to create the 9th grade Grade Point Average (GPA) Challenge at Bowie High School. This initiative was a great opportunity to show how we can all come together as a village – parents, administrators, the school board and local businesses. 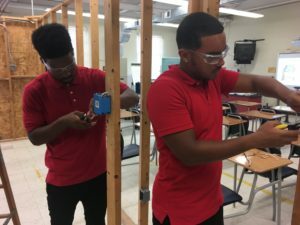 The Challenge: The concept was simple: Challenge the 9th graders at Bowie High School to improve their GPA by 10% between the 2nd and 3rd quarters (the third quarter ended March 24, 2017). Make it open to all 9th graders, not just the usual suspects — the high achievers. Invite them to a celebration event at the end of the challenge. Provide certificates of achievement to the students that met the goal and enter them into a raffle for a chance to win gift cards from local establishments. One goal of the program was to inspire other busy parents to get involved in a highly visible way with the school and their student, during future initiatives. Another was to demonstrate a true collaboration across stakeholders in our community. The Village: Several parents joined forces to implement the challenge. Collaborating mostly through conference calls and email, extra tutoring was arranged, a menu for the party was developed, and strategies for securing additional support were executed. For example, businesses and a school board representative provided much-needed funds for supplies and food. Additional families donated to the cause. School administrators promoted the GPA challenge by including mention of the challenge during the school’s morning announcements. Administrators also crunched the data and created the space for the celebration to occur. Destination Imagination (DI) is an international competition for students of all ages that promotes independence, leadership, creativity, critical thinking and teamwork. Teams compete at regional tournaments, and qualifying teams move on to States and Globals. My husband has enjoyed managing our oldest son’s DI team for four years at the TAG elementary school. This year I took on the challenge of managing a team for our middle child, a third grader at the neighborhood school. His school did not have a DI program in place, so I reached out to our new principal and the regional DI coordinator for help in getting a team started. This year, we started small with a team of five: four boys and one girl. As a mom of three boys, I felt I could handle it. Destination Imagination is completely led by the students on the team. Teams choose one of seven challenges (Fine Arts, Engineering, Scientific, Improv, Service/learning, Technical, and Early Learning) and present their solution at a regional tournament in February, March, or April. The team also chooses their team name and decides how they will divide the work and solve the challenge. My team chose the Fine Arts Challenge: Vanished! They were tasked with presenting a story about the disappearance of a color and how it affected a world. Additionally, they had to create a colorful character that was either involved in or affected by the disappearance of the color. And finally, they had to use a theatrical method to create a vanishing act. This was to be an eight-minute presentation. It’s a tall order for two third graders, two fourth graders, and one fifth grader. Journey to Kindergarten: We’ve Arrived! This is the sixth part of a series documenting the steps one family is taking to prepare for their son’s entrance into kindergarten next year. Read Part 1 here, Part 2 here, Part 3 here, Part 4 here, and Part 5 here. We’re nearing the end of 2016 already, and are moving into the second part of the school year. It’s flown by so fast, but we are enjoying — and surviving — kindergarten! Every encounter with staff has been positive. I have called and visited the front office, emailed my son’s teacher, walked into the building unsure where to go and have always received a pleasant response/answer. They host wonderful events. My husband ranted and raved about Danishes for Dads, a program held one morning in October to honor the men in the student’s lives. Our boy surprised my hubby by reading a few sweet sentences he’d written about him. An Active PTA. So far, there have been two dances, a book fair, a holiday gift shop, a fundraiser, and Chick-Fil-A and Chuck E. Cheese night. I love that there are parents like me who are so actively involved. We are so happy and blessed to be having such a wonderful experience thus far. We look forward to watching our boy grow and mature in his time at his new school and will be looking forward to his brother joining him there in just a couple of years. Make no mistake, parents are having tough conversations about school choices this time of year. It was no different for my family last fall when discussing options for my daughter, who at the time was in 8th grade and beginning her 6th and final year at a parochial school in Bowie. Fast forward to 2016, and we’re a couple of months into her transition to Bowie High School (BHS). I’m writing to share my own thoughts on my daughter’s transition and suggestions for middle school parents and Prince George’s County Public School (PGCPS) officials. Financial considerations were a primary factor in our decision to transition from private to public high school. Yearly tuition for private high school tends to be substantially higher than it is for the middle grades. A family could easily spend $60K for high school over four years, compared to $30K or more in middle school, over the same time period. Furthermore, our second child would enter high school in my daughter’s junior year, and we assumed there would again be a period of overlap in college. We engaged in a number of information gathering activities to help us make a more informed decision. To better understand public school options, we investigated specialty programs for highly motivated students (ex. Summit at Bowie High), toured the facility for 9th grade students at BHS, and met with several BHS students and their parents. Our key findings were not surprising. We did not discover a treasure trove of gleaming facilities, but we didmeet staff and parents with similar goals. The students we spoke with described experiences that were fair to positive, and we heard no anecdotes that were cause for alarm. Last but certainly not least, there was an element of hope for potential improvement in our public schools, over time. Through Prince George’s County Advocates for Better Public Schools (PGCABS) and other venues, I began meeting people interested in public school advocacy, and I interacted with various levels of PGCPS administrators who seemed to welcome outreach from people in the community. We’re only two months into the high school journey, but my daughter is doing fine. Below I provide comments ranging from the social environment to academics. High on the list of factors that impact the adjustment to high school is the ease at which a student makes new friends. While the majority of 9th grade students appear to come from the public middle schools that feed into BHS, it appears that a sizeable number of students are new to the area and my daughter has made a number of friends from this pool. Also, school spirit seems to be fairly high from what I gathered while volunteering during homecoming week. I’m pleased to report that we have had no significant issues with transportation. I’m aware that transportation issues are a major concern for students county-wide. The environment seems to be safe and orderly. My daughter has stated that in most of her classes, students actively participate and there is minimal disruption to the daily routine.